Details:The resort that hosted the 1960 Winter Olympics is internationally renowned for its terrain, with 3,600 skiable acres on six peaks. And since its November 2011 combination with neighboring Alpine Meadows, skiers and riders can take advantage of 270-plus trails at the two resorts with a single lift ticket or season pass. New for 2012-13: The second year of a five-year, $50 million improvement effort produced many new amenities including the Big Blue Express, a six-passenger high-speed chairlift, and the reconfiguring of its path to give skiers and boarders access to beginner and intermediate terrain that previously was inaccessible via the older chairlift that Big Blue replaces. The “Big Blue Express Cleared for Takeoff” video on YouTube shows some of what went into building the new chairlift. Elsewhere on the hill, the Mountain Meadow triple chairlift replaces an old double, and its route also was changed to take skiers and riders up to the ridgeline near the top terminals of the Solitude and Silverado lifts to provide a better experience for beginners. 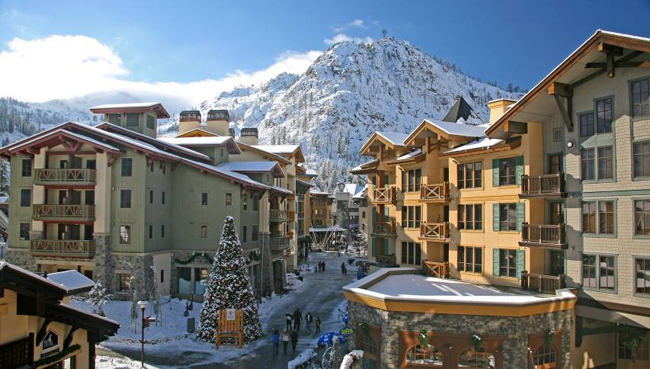 Best lift deal: The dual-mountain “superpass,” starting at $429, offers access to Squaw Valley and Alpine Meadows. Information: www.tahoesuperpass.com. Other deals will be announced during the season. Snowmaking: Off-season improvements include the installation of high-tech air/water guns, the replacement of manual fan guns with automatic versions, and the installation of the latest monitoring and control equipment. After dark: Night skiing/riding on weekends (late December through mid-March) and holidays. Spotted last season: Melissa Joan Hart was sighted at 22 Bistro, and Daniel Tosh was seen nearby in Tahoe City. Squaw and the adjacent Alpine Meadows are both playgrounds for Robin Williams. 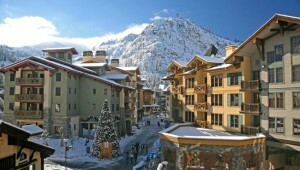 Where to stay: The Village at Squaw (866-818-6963, www.squaw.com/the-village/lodging) is a place to stay that’s steps away from shopping, dining — and the slopes. Amenities include whirlpool spas, billiards, and fire pits. Nicely appointed accommodations range from the standard one-bedroom and studio condos up to three-bedroom, 1,350-square-foot suites that sleep up to eight guests. Many have balconies that afford great views of the mountains. Eats at the resort: The Olympic Plaza Bar underwent a $300,000 makeover, and now emphasizes Squaw’s Olympic heritage and boasts new rustic chic furnishings. Menu options include flatbread pizzas, artisan meat and cheese platters, and finger foods. For higher-end dining, there are PlumpJack Café (530-583-1578, www.plumpjackcafe.com), which was founded by California Lt. Gov. Gavin Newsom, and Graham’s (530-581-0454). “Both of these restaurants have incredible wine lists and sensational food,” Richmond said. Rocker@Squaw, which honors the resort’s skiing legends, has a menu option for those who are truly famished (or willing to share): the 4-pound G.N.A.R. burger with angus beef, pulled pork and chicken. Après-snow hotspot: KT Base Bar at the resort has great food, incredible views of the mountain and large firepits.